So good they named it once. New York Comic Con 2017 starts today and we're bringing you everything that's happening in the Big Apple, from panel schedules to what exclusives you can pick up on the show floor. 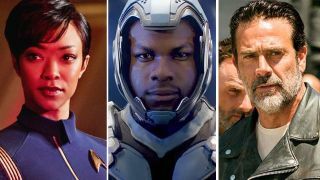 Not only will The Walking Dead cast be there to talk all things season 8, John Boyega will be attending to tease his upcoming movie Pacific Rim Uprising, and Star Trek Discovery will be going boldly into Madison Square Garden. If you aren't able to drop into NYC for the four-day entertainment-fest then GamesRadar+ will be covering all the major announcements, as they happen. This article will wrap it all up for you. And if you're reading this during the show, be sure to tell us what's got you excited at NYCC. American Gods, perhaps? Or maybe a sneak peek at the Doctor Who Christmas Special? Let us know in the comments below and remember to stick with GR+ for everything that's going down at New York Comic Con 2017. What is New York Comic Con? In a nutshell, a pop-culture extravaganza. Situated at the Javits Center in New York, you'll be able to rub shoulders with stars of film and TV, chat with comic book creators and artists, and attend panels highlighting and showcasing your favourite ongoing and upcoming TV shows and movies. While not as big as its West Coast cousin SDCC 2017, you can still expect big cast meet-ups, trailer premieres, and maybe - just maybe - a few shock announcements. When is New York Comic Con? Mark your calendars because the event takes place across 4 days from 5-8 October, 2017 with marquee panels and guest appearances (which you can find out more about below) on every single day. Where can I watch New York Comic Con? Not all of us are lucky enough to make it to Manhattan so you'll have to settle for streaming select NYCC panels through your device, be it your PC, Mac, or, heck, even your new iPhone 8. Collider is livestreaming a selection of panels including Pacific Rim Uprising and The Walking Dead so check out their YouTube channel if you want to watch them. GamesRadar+ will also help you keep on top of all the big news and reveals, you lucky things. What is the New York Comic Con schedule? You can see a full list of all panels, seminars, and activities here on the New York Comic Con 2017 website. But I know you're busy and don't have time to pore over every little panel and event. Thankfully, there's something for everyone across all four days, so let's break down the highlights and choicest cuts bit by bit - including times for both the East Coast and those across the pond in the UK. Fresh from his turn as Mary Poppins/Yondu in Guardians of the Galaxy 2, as well as having spent a considerable time as the redneck you'd love to punch, Merle Dixon, on The Walking Dead, Rooker is bound to have amusing anecdotes a-plenty and a few juicy behind-the-scenes tidbits to share. There are already so many questions swirling after that American Gods season finale - and this panel will be the place where (hopefully) some of those questions get answered. Three of the cast, Ricky Whittle, Yetide Badaki, and Pablo Schrieber will be at the panel, as well as appearing across all four days of the convention. The news that Peter Capaldi would be leaving Doctor Who after the Christmas special is bound to be high on the agenda during his panel. Will he give us a brief hint at what's to come - and could the first female Doctor Jodie Whittaker pop by? Immediately after Peter Capaldi's panel comes the first marquee panel of NYCC 2017 from Madison Square Garden. It's sure to be a wild ride as lots of the Pacific Rim sequel has been kept under-wraps until now. Expect a clip or two and John Boyega to also grace us with his presence. Are we ok to ask about Star Wars: The Last Jedi? If an hour of laser-focused discussion and reveals surrounding Star Trek: Discovery sounds like your thing then Madison Square Garden is the place to be on the Saturday. Promising to be chock-full of appearances from cast, as well as executives behind the show, this is one panel not to be missed. Due to the tragic shootings in Las Vegas, The Punisher have cancelled their NYCC panel. The Walking Dead season 8 brings Rick and the gang on the cusp of all-out war with Negan and his set of Saviours. Here's hoping Saturday evening's panel will shed some light on what's to come, and just what the deal is with Old Man Rick. The cast, including Andrew Lincoln, Jeffrey Dean Morgan, and Norman Reedus, and the brains (mmm, brains) behind the operation will converge to discuss all things Walking Dead for, probably, the event's most interesting hour. The truth is out there, and so is this panel discussing the upcoming second season of the X-Files revival. Mulder and Scully will both be there (let's face it, Gillian Anderson is worth the price of admission alone) to discuss the exclusive first-look at the new ten-episode run premiering in January. Will there be other New York Comic Con guests? The full list of guest attendees - and trust me, there are a lot of them - can be found here on the NYCC 2017 website, but below are the best of the bunch. NYCC always features a who's who of stars from the silver screen and TV - and this year is no different. Mark Hamill will be at the convention across all four days; Peter Capaldi and Pearl Mackie are scheduled to make appearances on both Thursday and Friday, as is Star Wars: Rogue One's Felicity Jones on the Friday in the official autographing area. Talking of the NYCC Autographing Area, Guardians of the Galaxy's Karen Gillan will be there across Saturday and Sunday, Michael Rooker on Thursday, Friday, and Saturday and also Luke Cage's Theo Rossi (who may or may not be wearing shades) will be signing across Saturday and Sunday. Finally, Game of Thrones' Lena Headey was scheduled to be at the event but will no longer appear. Sob. Ruling Westeros must be keeping her busy. What New York Comic Con exclusives will there be? It's not Comic Con without a few convention exclusives to make the toil and sweat (oh god, the sweat!) worth it. Let's start with what I know you all want… the New York Comic Con exclusive Funko Pop figures. Comic Cons and Marvel go hand-in-hand so it's not surprising to see exclusive Marvel Pops, uhh, pop up. If you're at NYCC you have a chance to get Thor: Ragnarok's casual Hulk, Grandmaster and also James Gunn. How's that for exclusive? Read more: The best Marvel merchandise - wallets assemble! Be sure to also be on the hunt for Game of Thrones' exclusive Pops, especially as one of them is Jaqen, the Faceless Man. If sass is more your thing, there's always Lyanna Mormont. Staying at home? Check out the best Game of Thrones merchandise. Funko's NYCC video game exclusives include some swanky 8-bit TMNT Pops (check out that Shredder!) alongside another retro 8-bit figure in the form of Dig Dug. If your video game tastes are a lot more contemporary then be sure to keep your eyes on the Five Night at Freddy's Lolbit figure, complete with CRT display. You can see them all in Funko's video reveal of their video game exclusives. If Funko NYCC TV exclusives are more your bag then you're not going to want to miss out on the exclusive Dolores Westworld Pop figure. That's not all: Stranger Things is representing with its Electrode Eleven figure and, if straight-up sci-fi is more your thing, then the First Doctor from Doctor Who will make a timely gift for someone ahead of the Christmas Special. There's even a Buffy the Vampire Slayer two-pack with Buffy and Faith so be sure to save up your pennies! Want more Stranger Things stuff? Head right this way for the best Stranger Things merch this side of the Upside Down. Already mentally spent all of your money? I'm sorry to say there's more. Lots more. Funko have a swathe of Star Wars exclusives to tide you over until the release of Star Wars: The Last Jedi in December. Star Wars: Rogue One's quartet of exclusive Pops include K-2SO in action pose, Saw Gerrera (with hair, naturally), Jyn in disguise, and a Death Star Droid. They've even thrown in Dengar and Boba Fett from the original trilogy if you're planning on keeping it old-school in NYC.